Apple have an excellent track record of providing backward compatibility with existing apps when new devices or versions of iOS are released. Apps are letter-boxed or zoomed to fit larger screen sizes. iOS will often behave like an earlier version to avoid breaking any assumptions that an older app might be making about its environment. Apple go to a lot of effort to try and make older apps function correctly on newer devices and iOS versions. The ways in which app developers implicitly or explicitly declare how forward-compatible their apps are is not the focus of this article. The version of Xcode an app is built with (and therefore the version of iOS it targets), the presence of a launch screen storyboard and certain Info.plist keys are the most important factors. What I want to discuss here is the new iPhone X and how it behaves when running both older and updated apps. the screen size is different: 375×812 points (1125×2436 pixels). the screen’s aspect ratio is different: it has the same width (in points, not actual physical size) as the iPhone 6/6s/7/8, but is noticeably taller. Since 2012’s iPhone 5, all iPhones have had an approximately 9:16 aspect ratio (measured as portrait width:height). The earlier 3.5" iPhones were 2:3. The iPhone X is approximately 9:19.5.
the notch: the status bar is split either side of a cutout area that houses the front camera, earpiece and other sensors. How does the iPhone X display apps on its distinctive screen? That depends on which version of Xcode the apps were built with. Apps that were built with Xcode 8 or earlier (i.e. targetting iOS 10 or earlier) are unaware of the existence of iOS 11’s large navigation bar titles and the new screen size of the iPhone X. Note, however, that 3× assets will be used, if available. 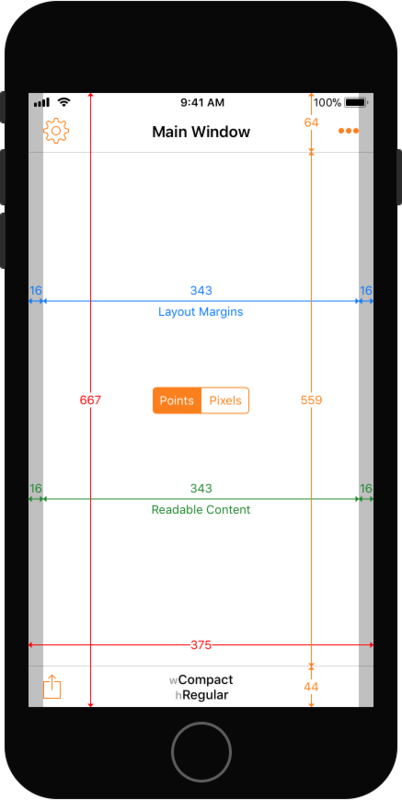 This shows the familiar 375×667 point portrait screen size of the 4.7" iPhones, with regular heights for the navigation bar (incorporating the 20pt status bar) and toolbar. The status bar is still up by the notch, but the app sees the screen as the exact same size as a 4.7" iPhone 6/6s/7/8. The navigation bar is still 64 points tall, as if there were a status bar. This is Apple’s backwards compatibility at work! In landscape, as you would expect, the app is pillar boxed but is also being zoomed down slightly on screen in order to leave space for the new grab handle at the bottom. 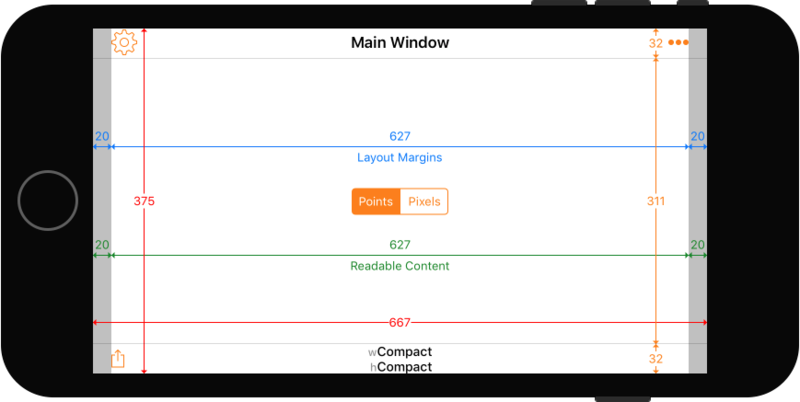 This means an app’s assets will not be displayed pixel perfect in landscape. The high pixel density should make this difficult to see in normal use. The toolbar is almost twice the normal height (83 points versus 44 points). As widely expected, Apple have designed the iPhone X and iOS 11 to behave in a backwardly-compatible manner for apps that were built with Xcode 8 and can’t reasonably be expected to be able to handle the new device. Even apps that use auto layout and have launch storyboards will be shown in the middle of the screen. Rebuilding with Xcode 9 opts the developer into the new screen design. You may not have realised that there were iPad Navigation Bar and Toolbar Height Changes in iOS 12.